The value of illustrations in business is tremendous. Illustrations decorate the presentations, reports, web-sites, training materials, and visual aids that quickly convey information to their intended audiences. Financial and business illustrations help to perceive information fully and quickly, because there are things that can be easily described visually, while a verbal description could take a large number of pages to convey. Illustrations play a big role and help in representation your business ideas, in visualization business strategies and business concepts, in financial advertising and construction business plans, and even in successfully addressing complex business problems. It is also impossible to overestimate their role in use on the business, analytical and commercial sites. Successful business illustrations, what are they? They are simple, but at the same time clear and stylish, creative, impactful, relevant and competitive, favorably allocating and emphasizing the main ideas. All these qualities for business illustrations can be achieved by creating them in ConceptDraw DIAGRAM software. The Business and Finance solution extends ConceptDraw DIAGRAM with samples, templates and vector clipart libraries to help create powerful business, management, advertising, project management, marketing and finance illustrations. This addition to ConceptDraw DIAGRAM helps you better illustrate diagrams that deal with business and finance subject matter. Use it to make professional-looking documents, presentations and websites, business, finance, advertising, and project management illustrations, or any designs that requires clipart of currency, office, business, advertising, management, marketing, people, time, post, contacts, collaboration, etc. There are 10 libraries containing 228 vector images in the Business and Finance solution. There are a few samples that you see on this page which were created in the ConceptDraw DIAGRAM application by using the Business and Finance solution. Some of the solution's capabilities as well as the professional results which you can achieve are all demonstrated here on this page. All source documents are vector graphic documents which are always available for modifying, reviewing and/or converting to many different formats, such as MS PowerPoint, PDF file, MS Visio, and many other graphic ones from the ConceptDraw Solution Park or ConceptDraw STORE. The Business and Finance solution is available to all ConceptDraw DIAGRAM users to get installed and used while working in the ConceptDraw DIAGRAM diagramming and drawing software. This example demonstrates how to create professional-looking business schemes and diagrams using ConceptDraw DIAGRAM with the Business and Finance Solution. An experienced user spent 10 minutes creating this sample. Using the Business People Figures Library for ConceptDraw DIAGRAM allows one to create thematic business illustration in seconds. High resolution vector illustrations are perfect for presentation needs. This illustration scales properly for large screens. This example was created using most of libraries from the Business and Finance Solution in ConceptDraw DIAGRAM. An experienced user spent 5 minutes creating this sample. Using the Business and Finance Solution libraries’ objects in combination with basic drawing shapes in ConceptDraw DIAGRAM allows you to produce effective and comprehensive business illustrations. High resolution vector illustrations are perfect for presentation needs. This illustration scales properly for large screens. This example was created in ConceptDraw DIAGRAM using Business People Clipart Library from Business and Finance Solution. An experienced user spent 15 minutes creating this sample. This business illustration demonstrates significant components of successful project management. High resolution vector illustrations are perfect for presentation needs. This illustration scales properly for large screens. This example was created in ConceptDraw DIAGRAM using the Business People Clipart Library from the Business and Finance Solution. An experienced user spent 10 minutes creating this sample. Using the Business People Clipart library for ConceptDraw DIAGRAM allows the user to produce professional-looking business illustrations in seconds. High-resolution vector illustrations are perfect for presentation needs. This illustration scales properly for large screens. This example was created in ConceptDraw DIAGRAM using the Advertising Library from the Business and Finance Solution. An experienced user spent 25 minutes creating this sample. This business illustration demonstrates the difference between the contemporary advertising model and the 1980’s one. High-resolution vector illustrations are perfect for presentation needs. This illustration scales properly for large screens. This example was created in ConceptDraw DIAGRAM using the Time and Money Libraries from the Business and Finance Solution. An experienced user spent 15 minutes creating this sample. Using the Time and Money libraries for ConceptDraw DIAGRAM allows the user to produce memorable and impressive business illustrations in seconds. High-resolution vector illustrations are perfect for presentation needs. This illustration scales properly for large screens. This Mind Map sample outlines the processes of creative thought and modern methods of innovation and generation ideas, solutions and thoughts. Thinking is a cognitive activity of the person, mental and psychological process of search of the correct decision, proceeding from available data on a defined problem or task, the possible ways of its solution with the greatest benefit, the process of modeling of laws of the surrounding world. It is also distinguished the creative thinking that is a way of looking at the situations, actions, or problems from the another, fresh perspective. The creative thinking is incredibly useful in many situations and can be stimulated by such well-known techniques, as mind mapping, brainstorming, thinking hats, lateral thinking, and many others presented on this diagram. Succeed in creative thinking, use its effective methods, techniques, and tricks and you are going to solve any task or problem in a few minutes. 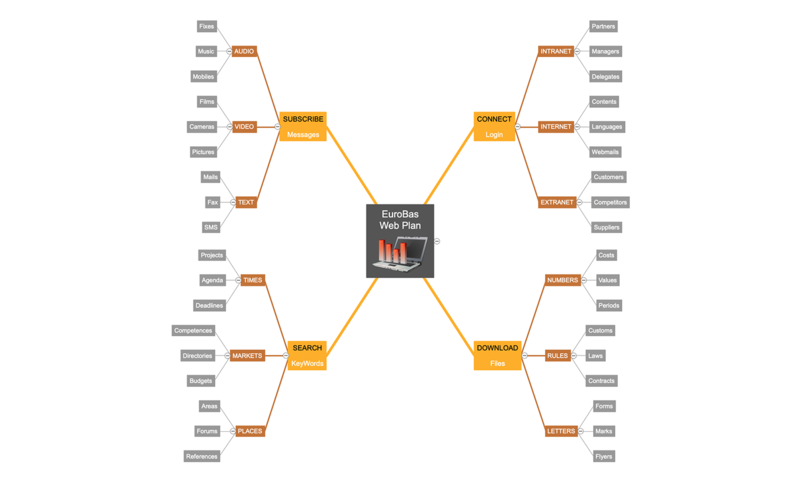 This Mind Map sample demonstrates the EuroBas system web plan. The web system supposes the entering of login to connect to the system, the subscribe to messages and news, the use of keywords in filling texts to be well searched by the searching systems, and allows downloading the files. The Subscribe, Connect, Search and Download are the topics of the first level for the main idea, each of these topics has three subtopics, which at their turn have also three subtopics each one. It is a typical structure of a Mind Map and ConceptDraw MINDMAP software allowed designing it neatly and precisely. Pay attention that the topics of the same level are colored identically and different levels vary in a color filling. The color difference along with the use of ready-made clipart is the best way to make your map visual. The large variety of solution's graphics sets is going to be the real help in illustrating your Mind Maps. This Mind Map sample is dedicated to the ways of achieving a positive response. There are distinguished six main types of behaviors and actions to get a positive response: authority (when you show your power and dominance), scarcity (when the illusion of lack is created to provoke a quick solution making, for example about a purchase), liking (plays a great role and positively influences on the people actions in contrast to our actions when we don't like something), reciprocation (the desire to do something in return on some positive action made to us), consistency (when a general agreement and unity is achieved) social validation (providing the evidence that the product or service meets the end user requirements). It is a multi-layer map because all listed main ways have many subitems and additional related information that the author also wanted to present on this Mind Map. ConceptDraw MINDMAP ideally suits for designing multi-layers maps. This Mind Map describes the most effective concepts and methods of strategic thinking. There are represented the following ones: BCG-Growth Share Matrix, Balanced Scorecard, Porter’s Five Forces, PEST, McKinsey 7-S Framework, Four Ps Marketing Matrix, Product Life Cycle, Porter’s Value Chain, Scenario Planning, SWOT Analysis. The strategic thinking is determined as a human's thinking or mental process applied to reach goals and to achieve success. It is the ability to solve any problem and task and to reach success in any situation by means of the precise system and program approach. The strategic thinking is a highly valuable skill, it is the ability to know precisely what you want to achieve and how to do it. It lets generating the unique business insights and so ensures easy achievement the competitive advantage in highly competitive and fast-changing conditions, that gives the unique opportunities in business, marketing, management, and many other fields of activity. Both ConceptDraw DIAGRAM diagramming and drawing software and the Business and Finance solution can help creating the illustrations you need. The Business and Finance solution can be found in the Illustration area of ConceptDraw STORE application that can be downloaded from this site. Make sure that both ConceptDraw DIAGRAM and ConceptDraw STORE applications are installed on your computer before you get started. After ConceptDraw STORE and ConceptDraw DIAGRAM are downloaded and installed, you can install the Business and Finance solution from the ConceptDraw STORE.